An Extensive Rift System on the Moon? Gravity data from NASA's GRAIL mission suggests that Oceanus Procellarum is surrounded by a buried rift system. 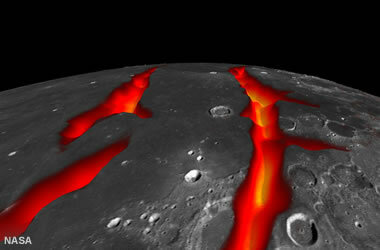 Figure 1: An artist's concept of what the rifts that form a border around Oceanus Procellarum might have looked like while they were flooded with lava. Image credit: NASA / Colorado School of Mines / MIT / JPL / GSFC. New gravity maps prepared using data from NASA's Gravity Recovery and Interior Laboratory (GRAIL) spacecraft reveal that Oceanus Procellarum, the largest lunar mare, was not formed by a massive asteroid impact. Instead, it is an area that was flooded by lava from an extensive rift system (Figure 1). 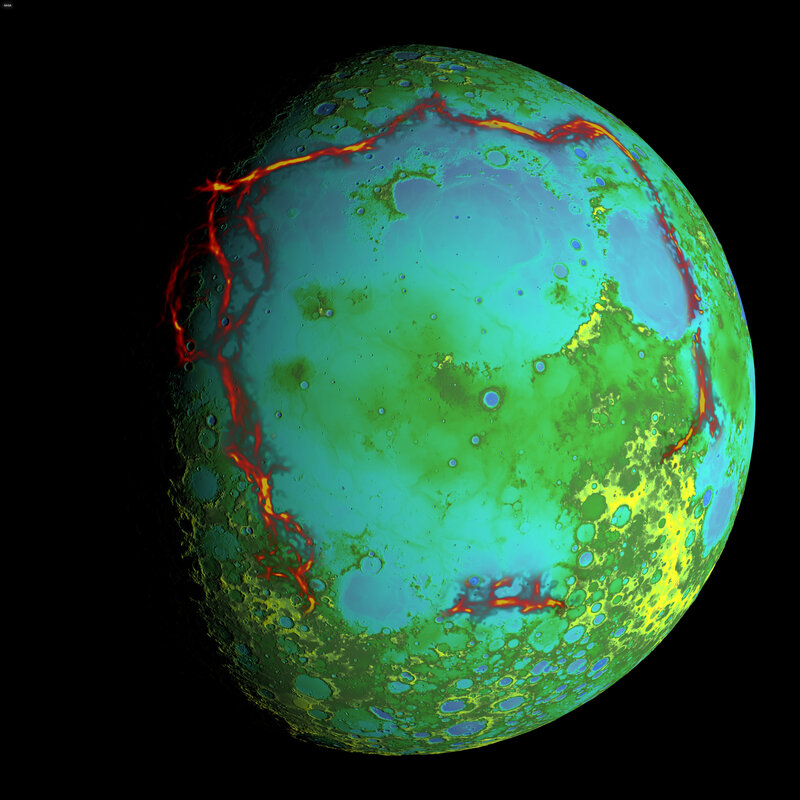 This discovery appears to rewrite the geologic history for the near side of the moon. Figure 2: Image of the near side of the moon from the Galileo Spacecraft showing the dark Oceanus Procellarum spanning across the northwestern quadrant. Image credit: NASA/JPL. An Impact Structure or a Rift-Bounded Basin? 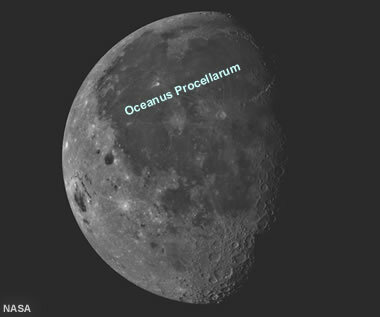 Oceanus Procellarum is a large lunar mare with an irregular outline that spans the northwest quadrant of the moon’s near side. It is one of the largest features on the moon, with a relatively flat surface and a width of approximately 1,800 miles (Figure 2). Figure 3: The red in this image represents the pattern of rifting around Oceanus Procellarum inferred by gravity anomalies from the Gravity Recovery and Interior Laboratory (GRAIL) mission. This rectangular outline is thought to be the remnant of a rift system that delivered magma to the surface of the moon's near side, flooding low-lying areas with lava. The rectangular outline differs from the circular outline expected for an asteroid impact structure. The pattern resembles fractures that develop in materials in response to thermal stress. Image credit: Ernie Wright, NASA Scientific Visualization Studio. Enlarge map. NASA's GRAIL mission consisted of a pair of satellites that orbited the moon at an altitude of about 34 miles. They collected gravity measurements capable of revealing density differences in the lunar subsurface as well as the thickness of the lunar crust. The satellites flew in close formation. As they passed over areas of the moon with greater and lesser gravity, the distance between the satellites was modified by the strength of the moon's gravitational attraction. These distance changes were then used to produce gravity and crustal thickness maps of the moon (Figure 4). 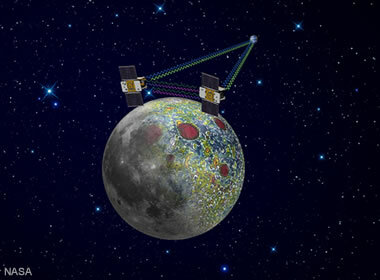 GRAIL satellites: Artist's rendition of the twin GRAIL satellites orbiting the moon, collecting gravity data and transmitting it back to Earth. Image by NASA/JPL-Caltech. 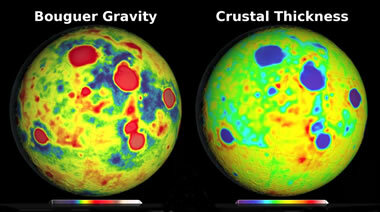 Figure 4: Bouguer gravity and crustal thickness maps of the near side of the moon. The gravity map reveals the locations of impact craters and the inferred rift systems. The crustal thickness map reveals a very thin crust beneath obvious impact structures but a crust of irregular thickness beneath Oceanus Procellarum. Image credit: NASA Scientific Visualization Studio. 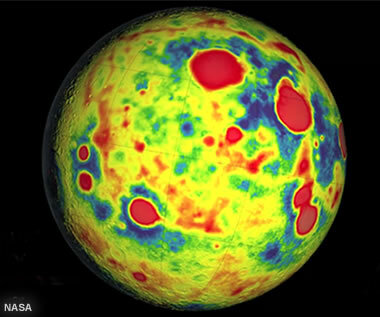 Figure 5: Bouguer gravity map of the near side of the moon. The gravity features of the inferred rift system can be seen as a red rectangle roughly outlining the Oceanus Procellarum. Image credit: NASA Scientific Visualization Studio. 1) They found gravity features that suggest a buried rift system that forms a rectangular outline around the Oceanus Procellarum (the location of this proposed rift system is shown in red in Figure 3). The rectangular outline of the rift system closely matches the current shape of Oceanus Procellarum and is unlike what would be expected in response to an asteroid impact. The gravity features thought to be rifts can also be seen in red on the gravity map (Figure 5). 2) They found distinct circular gravity features under all the moon's obvious large impact craters (These appear as the circular red features in Figure 4). 3) They did not find a similar circular gravity feature beneath Oceanus Procellarum. Instead, gravity values suggested a crust of variable thickness in that area (Figure 4) . The gravity data from the GRAIL mission appears to kill the impact formation theory for Oceanus Procellarum. Instead, it supports a formation created by flood basalts from a massive rift system. Ocean of Storms, Oceans of Argument: Paul D. Spudis; article published on the AirSpaceMag.com website; November 1, 2012. What Put the Man in the Moon in the Moon? : Phil Plait; article on the Bad Astronomy Blog on Slate.com, October 2, 2014. NASA Mission Points to Origin of 'Ocean of Storms' on Earth's Moon: D.C. Agle, NASA Jet Propulsion Laboratory; Dwayne Brown, NASA Headquarters; Kathleen Morton, Colorado School of Mines; Press Release published on the NASA website, October 1, 2014. Procellarum Rifts for the Cover of Nature: Ernie Wright, Visualizer/Animator; Jeff Andrews-Hanna, Scientist; NASA's Scientific Visualization Studio; Visualization Release published on the NASA website, October 1, 2014. GRAIL Primary Mission Gravity Maps: Ernie Wright, Visualizer/Animator; Maria Zuber and Erwan M. Mazarico, Scientists, Massachusetts Institute of Technology; NASA's Goddard Space Flight Center Scientific Visualization Studio; Visualization Release published on the NASA website; December 5, 2012. Basalt: Hobart King; article on Geology.com. This new idea for the formation of Oceanus Procellarum is a theory based upon remotely collected information. It might be correct or cast aside as new ideas or new information become available. Even if a team of humans visited the moon and collected drilling or seismic data across Oceanus Procellarum, their ability to improve on this theory might not be possible. The answer is difficult to "know" because the available data will always be fragmentary and subject to interpretation.